We've all been told to BTFD. One trader even went so far as to post it on his license plate like a central bank billboard. Now, we finally have a chart to remind us why this is truly the only strategy that matters in these "markets." Yes, it's really as simple as it sounds. Whenever the market is down at least 1%, you buy the index with a little leverage, put on your central banker hat, and watch the money roll in. With hedge funds struggling to perform and major funds actually shutting down, it makes you wonder just what quantitative gymnastics they're trying to pull off. All they had to do was BTFD! 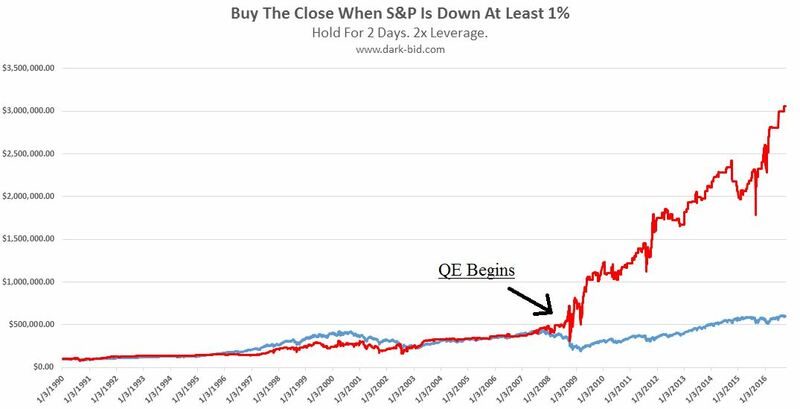 And with the Fed admitting that $4 trillion in QE will be needed to offset the next crisis, it doesn't appear this strategy is going to lose its luster any time soon.